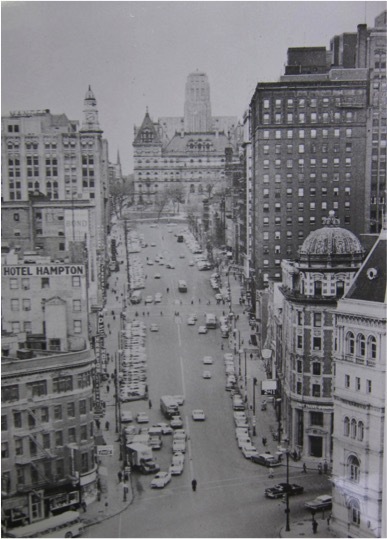 On March 30, 1962, the Times Union editorial board urged readers, who harbored “doubts” about the wisdom of the State of New York’s plan to seize and redevelop the South Mall area, to “drive slowly—or walk—up and down these once proud streets. Then decide for yourself.” The implication, of course, was that anyone who viewed the area firsthand would favor the State’s plan. The Knickerbocker News published a version of this State photo on March 29. 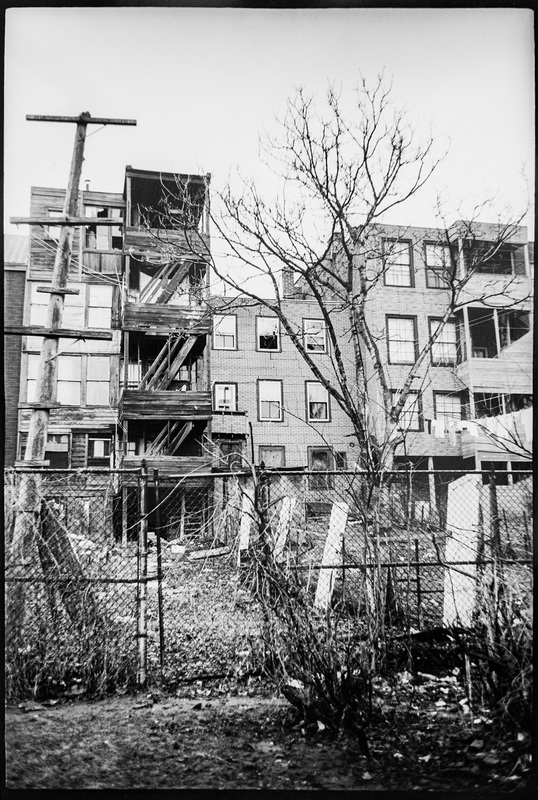 The caption read: “A rickety rear wooden staircase in back of Lancaster Street is typical of the ‘unseen’ view of many of the homes likely to be razed by the state for its development project.” NYS Archives. This editorial was, in part, a response to Mayor Erastus Corning’s opposition to the South Mall. Corning reacted immediately to the State’s seizure with a scathing public letter, asserting that the State was violating the “human rights” of the families who would be displaced. He complained about the size of the appropriation, accusing the State of planning to build a “sprawling colossus.” The State’s actions were “completely unnecessary and inhumane,” he charged. “It is what might be expected in a dictatorship—not here.” Corning and the Democratic Party would continue to oppose the State throughout the summer, until late August, when the City lost its court case challenging the seizure. Beginning on the day the State announced its plan and continuing for the next several months, both the Times Union and Knickerbocker News published stories, editorials, and, perhaps most importantly, photographs designed to build the case for redevelopment. (Gene Robb, the publisher of both papers, was a member of the Temporary Commission on the Capital City and an enthusiastic supporter of the South Mall project.) Some of these photographs came directly from the State and focused on the most blighted sections of the redevelopment area. The implicit argument was that the area was on an irreversible course of decline and could not be rehabilitated—only wholesale demolition could excise the blight. This State photograph appeared on the front page of the Times Union, March 28, 1962. NYS Archives. 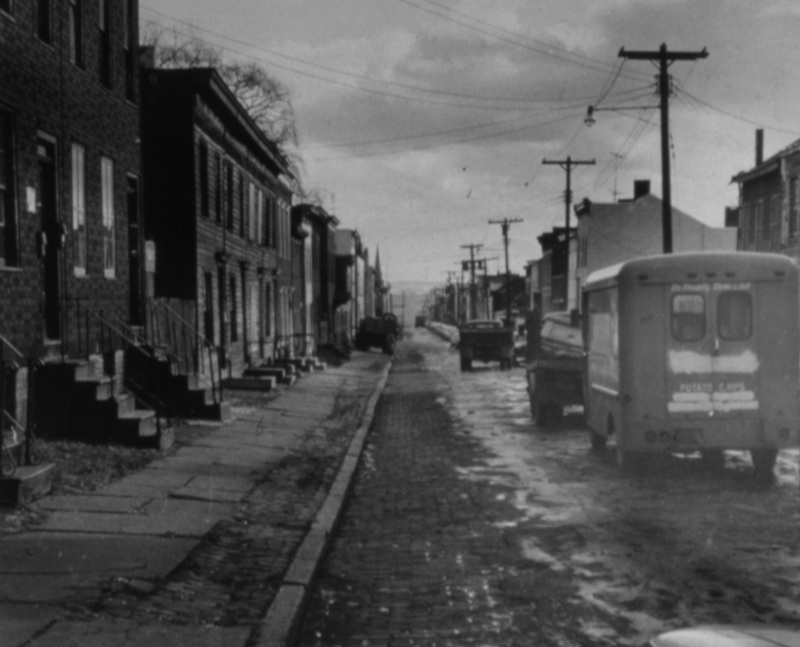 On March 28, two days after the South Mall redevelopment plan was made public, the Times Union published five State photographs depicting the area as “one of misery, of decadence, of dismal alleyways filled with garbage,… of buildings filled with nothing but despair…. These are camera truths, needing no further explanations, for the story of each is here to see.” The following day, the Knickerbocker News ran a similar piece, also based on State photographs. Staff and consultants of the Temporary Commission (particularly Executive Secretary William McGlone) gave several public presentations to community groups around the city starting in the fall of 1961. But the effort ramped up after the spring of 1962. The following images and text were part of a slide show presentation used to argue that the South Mall area was in desperate need of redevelopment. 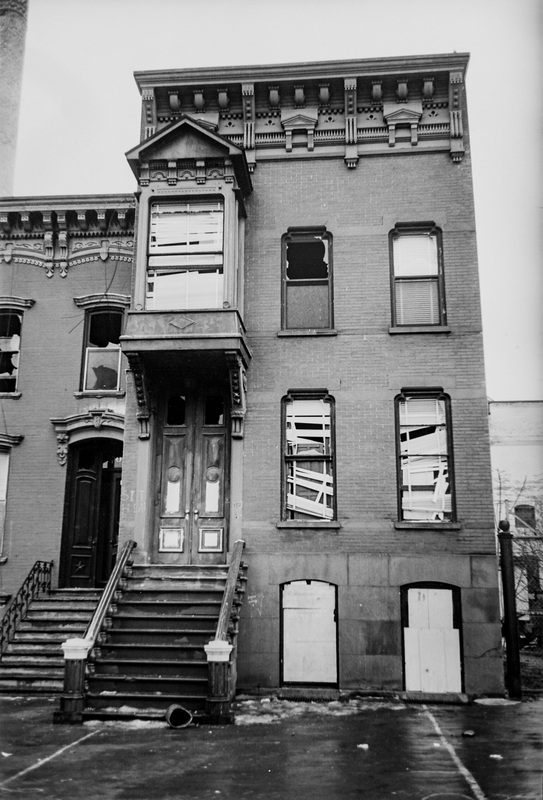 “This slide [of Myrtle Ave.] shows the condition of housing along one of the streets in the South Mall area.” NYS Archives. “Again, a little insight into the problems which the plan seeks to solve. This is a view of the official residence for the Governor of the greatest state in this nation. 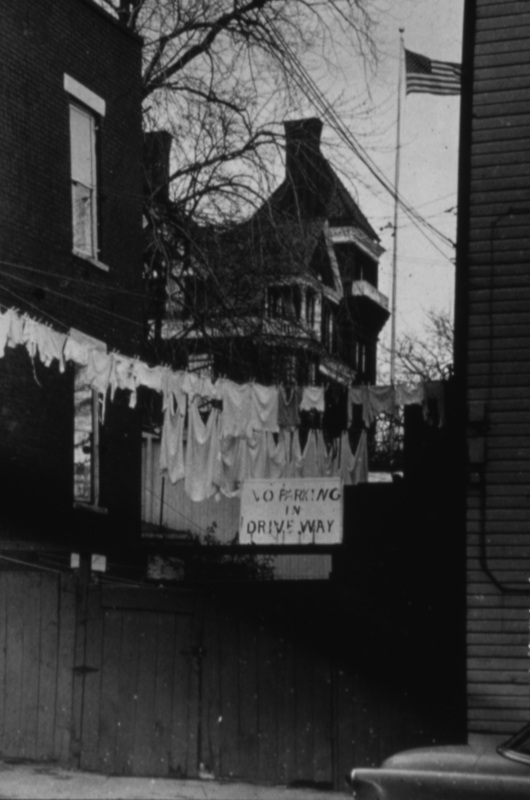 The clothesline related to the flag, I think, is an interesting comparison.” NYS Archives. “These industries are hemmed in and obsolescent and have, in fact, blighted the waterfront. A major reclamation of the Hudson River is therefore a central objective of the plan as well as a restatement of the image of state government in Albany.” NYS Archives. This slide illustrated “the congestion and dilapidation in the downtown area.” NYS Archives. 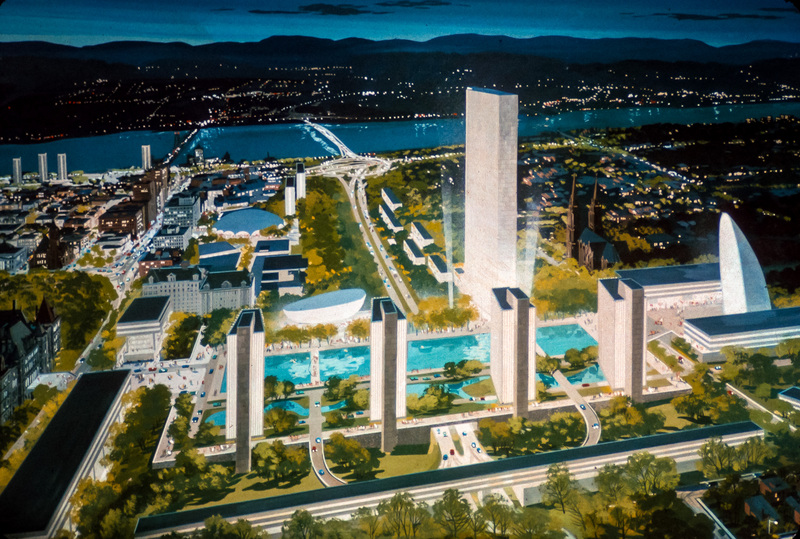 After the design of the new state office complex was made public in the spring of 1963, the slide presentation came to include artist renderings of the proposed South Mall. These images drew a sharp contrast between the old, blighted city and the modern State capitol complex. Again, the following text and images are drawn from the Temporary Commission slide show. Artist’s rendering of the South Mall at night. “This is an important aspect in the design of the South Mall since it is intended to be active and alive beyond the normal working hours of 9 to 5. It should indeed be a community and even a state-wide focal point quite apart from its functioning as a seat of state office employment.” NYS Archives. “A unique and dramatic feature of the South Mall is the egg-shaped design for the auditorium. 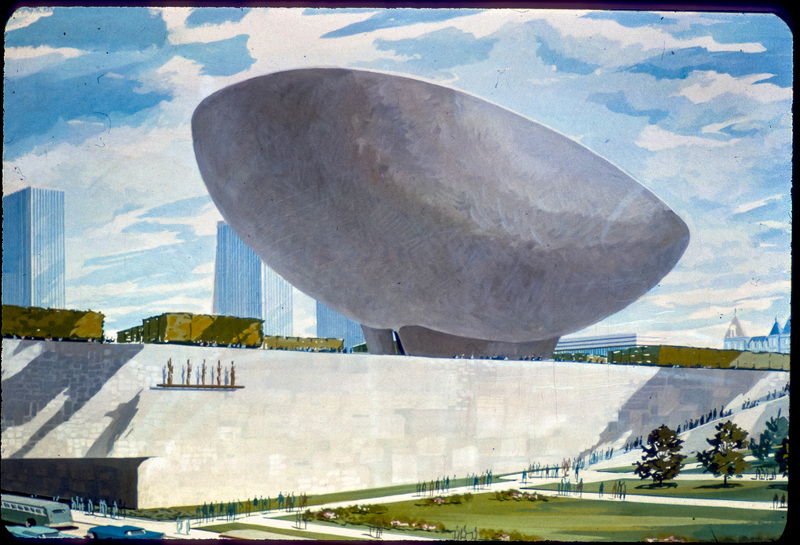 While this may appear to be a strange shape—in fact it is very functional and reflects the acoustical requirements and the sloping floor arrangements of the auditorium facility within it.” NYS Archives. “To emphasize that this is to be a lively and delightful place for the pedestrian as well as a functional place for the workings of state government. 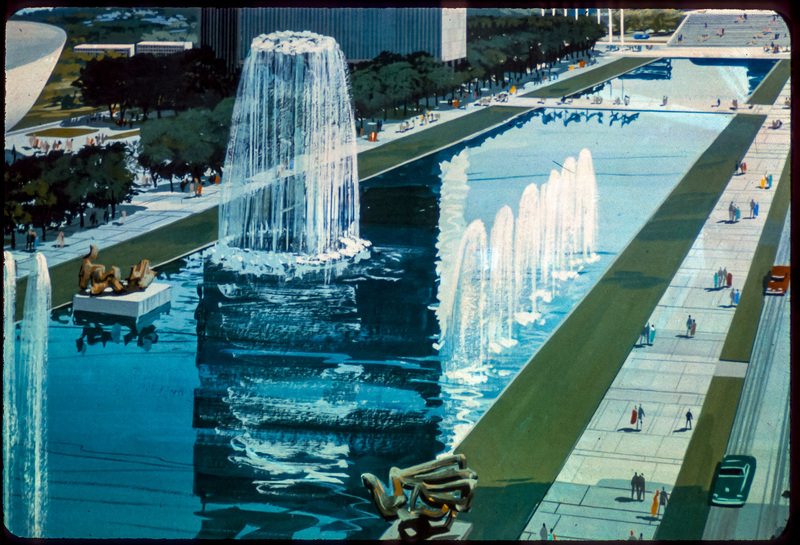 This is a view of the reflecting pool with the fountains flowing and the impression, I think, is clear as to the excitement and the delight that one would get in such an environment.” NYS Archives. Juxtaposed, the State’s photographs and architectural renderings tell only part of the story. The paintings provided an idealized vision of a future South Mall, a social hub and cultural center as well as a workplace. 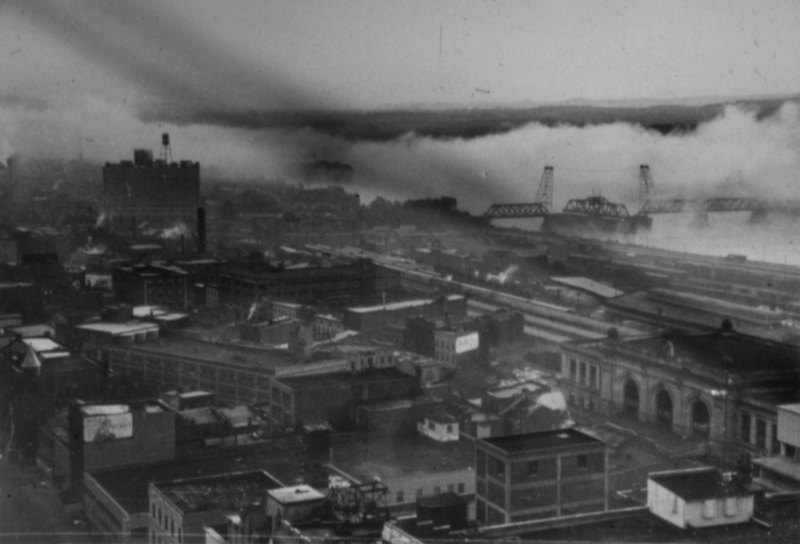 The photographs, by contrast, depicted a depopulated and deteriorating downtown. We don’t know how many readers took the Times Union up on its challenge to tour the redevelopment area—nor do we know how audiences responded to the State’s slide show. However, we suspect that some might have reached a different conclusion than the one promoted by the State in collaboration with the local press. Walking or driving through the area, persons undecided about the South Mall certainly would have seen crumbling factories, dilapidated housing, and debris-strewn lots. But they also would have passed by churches, small businesses, family homes, and the city’s central market. To sell the South Mall, the State and its supporters pursued a strategy familiar to proponents of urban renewal around the country, most famously New York City’s Robert Moses and his Committee on Slum Clearance. They selected photographs to emphasize the deterioration and disorganization of areas to be demolished and produced drawings to promote an idealized vision of the new. In New Brunswick, no one wanted to rely just on photos of “blight.” The variant was, buy the building. let it decay, declare it no longer worthy of historic preservation status, and Boom! take it down and let developers have their way. There’s a wonderful map that shows ownership of every building in the proposed development area, and, oh, so conveniently, most of them belong to the development authority. Nice piece.